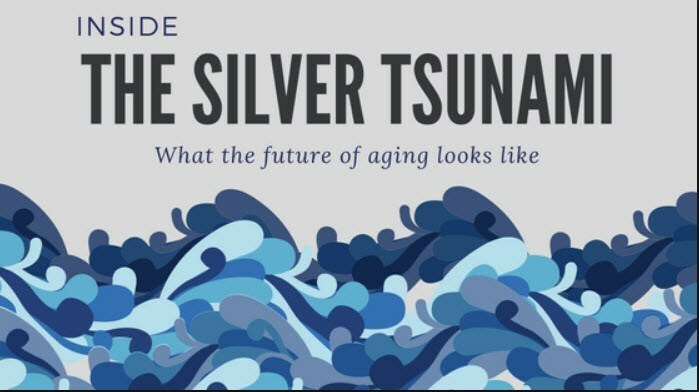 The Silver Tsunami, aka, senior citizens, is coming to a healthcare facility near you in the very near future. The question is: will healthcare facilities and providers be ready to handle the load? A Silver Tsunami is already underway and projections from the U.S. Census Bureau point to 2030 as a milestone year. Incredibly, in 2030 senior citizens will actually outnumber children for the first time in United States history. The Census Bureau also estimates that 20 per cent of Americans will hit retirement age by 2030. And just five years later in 2035, the number of citizens will 78 million, while 76 million will be 18 or younger. That is truly incredible. Silver Tsunami: Will Healthcare Facilities Be Ready? The important question is whether hospitals, skilled nursing facilities will be prepared to handle the load. The time to act is right now to handle the this demographic population shift. Aging brings with it, a unique set of chronic illness and health challenges. These are Alzheimer’s disease, Parkinsons disease, dementia and diabetes, to name just a few. To understand the challenge, consider Alzheimer’s disease. It doubles in prevalence every five years after age 60. By age 85, a senior has a 50% chance of getting this disease. As the population continues to age, the number of patients who have Alzheimer’s disease or other types of dementia will increase substantially. For those seniors who prefer to stay in their home, these illnesses require intensive care. With this population, there is an important caregiver-patient ratio referred to as the old-oldest support ratio. It is the number of caregivers divided by the number of patients requiring the care. The caregivers are typically 50 to 74 years old, and the patients are 85 or older. In 1970 this ratio was a healthy 31, in 2010 it was 10, and in 2050, it’s projected to be 4. That is not a very good ratio. The recent introduction and use of artificial intelligence (AI) and telehealth in healthcare will certainly expand. These technologies uses i hospitals and skilled nursing homes improves the level of healthcare as well as the quality of life. Combined with new treatments, health levels in the aged population should improve. Overall, the tsunami generation’s healthcare will benefit from a variety of innovations and improvements. For example, precision medicine, value-based care, telehealth, chronic disease management, and patient safety are just some of the key areas.